“Snow Squall” – painting is 7″ x 10″, matted and mounted to 11″ x 14″ for easy, low-cost framing. Snow had been falling lightly off and on all day long as I headed out to paint in the afternoon on January 20th. This farm is spread out along North Pownal Road in Pownal, Vermont and can be seen up on a hill in the distance from Cedar Hill Road. Being that it was a cold day, I parked my van so that I could open the back hatch and be sheltered from any snow and have a little comfort from the relative warmth inside the van. When the snow cover is light, fields take on a random mottled pattern, with alternate patches of white snow where the ground cover is low and tan spots where the leftover field grasses stand tall enough to show instead. Plowed fields, roads and trails generally show the white snow. 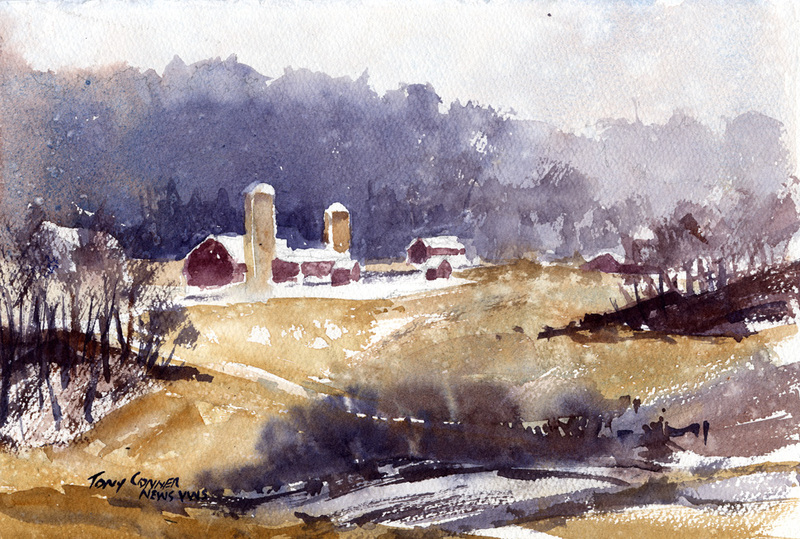 In this view, the fields leading up to the farm had that mottled look and I hoped to capture that in this painting. I sketched the scene in pencil, trying to capture the rhythmic movement of the rolling hills and patches of woods that lead up to the farm and noted the wispy presence of bare shrubs and bushes in the foreground. I had just started laying in the washes for the sky and distant trees when a snow squall arrived, dropping fairly heavy snow all around. The snow swirled and blew around and under my “cover”, landing on the wet passages and creating a random texture that seemed to resemble falling snowflakes. The heavy snow also obscured much of the color and detail of the farm buildings. This combination of factors created the opportunity to capture the look and feel of a snowstorm in progress. Following the visual cues, I painting the farm with indistinct edges and with lighter and low intensity color to achieve the sense of “looking through a snowstorm”. In fact, many of the the more detailed marks I might have added otherwise, were left out, with rough textured passages in the fore and middle ground areas serving as the only indication fo “detail” in the entire painting. This painting is 7″ x 11″ and matted to a standard size of 11″ x 14″ for easy, low-cost framing.